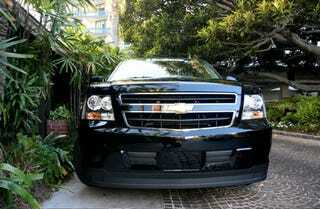 We recently got a chance behind the wheel of a road-test model 2008 Chevrolet Tahoe Hybrid. We can now confirm that yes, it is still an SUV as well as being a hybrid. At the heart of the Chevrolet's two-mode hybrid system, developed with BMW and the erstwhile DaimlerChrysler, is a transmission that brings together the planetary and fixed gears of an autobox with dual electric motors. That same transmission joins forces with a V8 engine to retain the part of SUV folks like, with the added bonus of an uptick in fuel efficiency. Installing the hybrid powertrain meant giving the Tahoe a distinctive look. Since the system adds on around 400 pounds of curb weight, GM engineers set about removing mass from other places. Aluminum replaces steel at the rear lift-gate, hood and bumper. An all-new stamping of the hood ties into modified front-end features to increase aerodynamic slip. Even the running boards have been redesigned to help the Tahoe slide thorough the air with less effort. Further mass was extracted from the seats, wheels and tires. Starting the Tahoe was standard turning-the-key type business. As in Toyota's Hybrid Synergy Drive system, the screen normally occupied by the navigation system now features animated graphics displaying what percentage of which mode is powering the vehicle. There's also a simpler economy gauge with a needle left of the speedometer to prevent driving mishaps while gazing at the fancy display. Also as in full hybrid systems like Toyota's and Ford's, a feather foot will keep the Tahoe in full electric mode. A leaden foot brought on the familiar Chevrolet V8 kick, which scooted the monster into motion as expected. Some quick regenerative braking brought the Tahoe to a stop, and full autostop mode silenced the behemoth in standstill Santa Monica, California traffic. The usual engine-driven accessories have been replaced by all-electric versions, so power steering and AC work while the Tahoe is running in both electric-only and autostop mode. Besides hanging out in California, the Tahoe and GMC cousin Yukon have both been run up to the cold of the Great White North for frigidity tests and down to Death Valley for a scorched-earth exam. As GM staff pointed out, the core hybrid technology behind the two-mode transmission had also been torture tested in the running gear of GM-Allison public transit buses before being incorporated into the larger GM hybrid plan, of which the two-mode Tahoe is just one part. The other part is the Volt plug-in dealy. Cramming hybrid technology into the existing Tahoe body without having to tear up the base platform or the Arlington, Texas plant where the Tahoe will be built has helped streamline production. GM expects to have the two-mode system installed in showroom Tahoes and Yukons available this this Fall as 2008 models. GM says the system improves city mileage by 40 percent. GM's has yet to reveal highway improvement figures, though had said the composite highway target was 25 percent. Engineers say they're hoping to best that highway figure when the official numbers are released. Channeling the power according to driver demand is the HOS, or Hybrid Operating System. By joining the HOS and two-mode transmission with existing engines, GM plans to make hybrid technology across the entire model lineup. Theoretically there are no limitations as to which engines can bolt up to the two-mode transmission, from full size trucks to smaller Saturns. A turbodiesel or even flex-fuel engine could married to the transmission, with the HOS sorting it all out. Such modularity could give GM an edge when it comes to hybrid line expansion. Pricing has yet to be announced, but we were assured the Tahoe and Yukon Hybrids would not be the most expensive models on the showroom floor. Still, we're saving our change for the Hoss Cartwright Bonanza Edition Yukon.